Sky High is made from a fuzzy purple material covered in bright pink patches. She has large sparkly blue and black button eyes and a white muzzle with pink stitching for her nose and mouth. The inside of her ears and her hooves are made from shiny blue fabric and she has two tiny blue and white horns on top of her head. She has a furry pink mane running down her neck. Sky High was introduced in September 2015. Her birthday is on 20th July. This is the small 6″ version of Sky High. 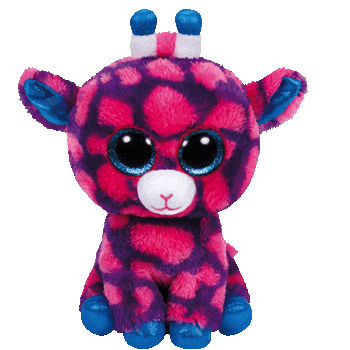 She was also released as a medium 9″ Beanie Boo Buddy, a large 16″ size and as a key clip.